The Doom remake hits shelves today, with thousands of gamers shunning the rare sunshine in favour of another jaunt to Hell with just a shotgun for company. Although Doom’s open beta received less than stellar reviews, mainly due to the fact that it borrows some modern FPS features like load outs, it promises to offer at least some of the original’s retro magic. If Doom isn’t quite retro enough for your tastes though, here are some old school first person shooters to revisit! 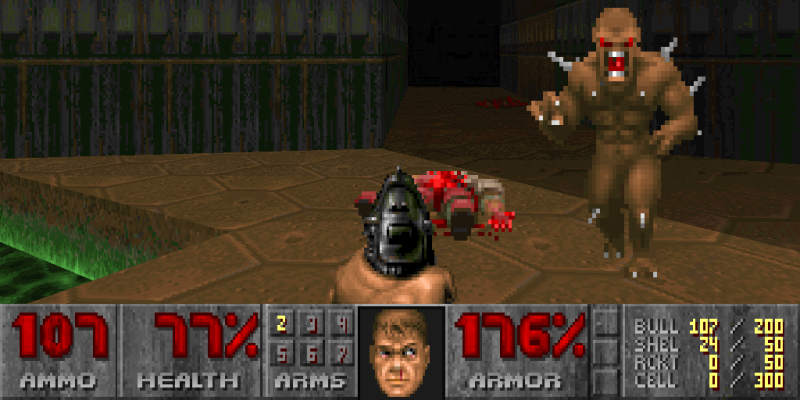 Although it was groundbreaking in 1993, we love Doom because it’s so simple. Man get gun, man finds demons from hell, man shoots demons from hell in the face – that kinda thing. That doesn’t mean it’s easy though. In fact, it’s tougher than a well done steak at an underground fight club: it’s incredibly fast, you don’t replenish any health over time and some of the baddies are honking great beasts with ridiculously powerful weapons. In short, you’re going to die. But at least you’ll have fun doing it. If you haven’t crowded around a small TV to play GoldenEye with your mates, you haven’t lived. You’ll laugh, you’ll bicker and one of you might even cry, but you’ll have hours of fun – especially if you turn big head mode on. Just make sure no-one plays as Oddjob. Imagine GoldenEye but with bigger levels, more guns and a slightly bonkers plot about time travel and you’ve got Timesplitters. The multiplayer is great fun but the solo campaign is equally great too, with each level taking place in a different time zone – which means you get to play with loads of different guns from throughout the ages. If you thought TimeSplitters sounded crazy, get a load of this: in Deus Ex, you play as an anti-terrorist agent who gets involved in a conspiracy involving, among others, the Triads and the Illuiminati (who else?)! You don’t just blast your way through the complicated plot though; you have to sneak, level up and chat to people too. It’s kind of like Skyrim mixed with Metal Gear mixed with Blade Runner, and it’s every bit as good as that sounds too! Before modern warfare became the in thing, World War 2 was all the rage in video games. Very few games did it as much justice as Frontline, though, which packed a potent emotional punch alongside all the shooting and explosions. The first level, which takes place on D-Day, is every bit as affecting as the opening of Saving Private Ryan, and remains one of the most memorable openings to any game ever. Quake III Arena realised something that a lot of comtemporary FPS games haven’t yet: you don’t need a single player mode if everyone is going to play multiplayer anyway. As a result, Quake III uses some vague mumbo-jumbo as an excuse to chuck up to 16 players into a map and ask them to shoot each other with massive guns (including the infamous BFG). Quake III plays to its strengths basically; it doesn’t want to be anything more than an outrageously fun first person shooter. Mission accomplished. The absolute king of story-driven first person shooters, Half-Life changed gaming as we know it when it was released in 1998. As a first person shooter, it’s brilliant. As a story, it’s even better. No game before it would have dared to make you wait in a monorail car just to make the eventual moment everything goes wrong even more powerful, but it was a risk Valve were willing to take to create an immersive story. It paid off massively. Over recent years, Duke Nukem has become gaming’s answer to a politically incorrect 70s comedian; while he still has his fans, most people think he’s a slightly cringeworthy, slightly offensive dinosaur. Or they just hate Duke Nukem Forever. One of the two. Still, there’s no denying that Duke Nukem 3D is a great game. It’s like Doom, if Doom replaced all the demons with pigs dressed as policemen and made half-naked women the main focus of the game. Turok 2 doesn’t have the reputation of other games in this post, but it certainly deserves it. From the completely insane plot about aliens trying to destroy ‘energy totums’ to the massive arsenal of weapons (including the disgusting but awesome Cerebral Bore), huge levels and surprisingly intelligent AI, this is a bona-fide classic. What is your favourite old school FPS? Let us know in the comments. If you want to take a trip down virtual memory lane, you can also buy retro games for low prices (and free delivery on all orders!) from the musicMagpie Store!